An introductory ceremony of narrative and decree against terrorism and extremism “Paigham-e- Pakistan” issued by Muftis and religious scholars of all schools of thought with the efforts of Islamic Research Institute (IRI) of the International Islamic University, Islamabad (IIUI) was held at Governor House, Karachi on Tuesday, March 20, 2018. Few months back, unanimous fatwa by 1829 scholars condemning extremism and terrorism had declared the supporters of suicide bombing as traitors, the religious decree defined jihad as being the purview of the state and disallowed the use of force to compel obedience to Islamic laws. 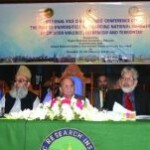 The Fatwa has been prepared by Islamic Research Institute (IRI) of International Islamic University Islamabad. Tuesday ceremony was attended by Governor Sindh, Muhammad Zubair, Chief Minister , Syed Murad Ali Shah, Chairman Higher Education Commission (HEC), Dr. Mukhatr Ahmed, Mufti Taqi Usmani, IIUI Rector, Dr. Masoom Yasinzai, IIUI President Dr. Ahmed Yousif Al-Draiweesh, IRI Director General, Dr. Muhammad Zia-ul-Haq, heads of five Wafaqs of Madaris, scholars and intellectuals. destructive attitudes was the need of hour. He furthered that national narrative will be a source of promotion of constructive thinking. 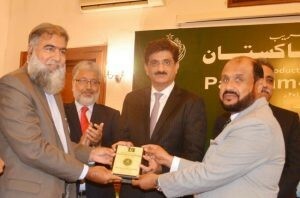 Governor Sindh hailed IRI of IIUI for its efforts in launch and dissemination of Paigham-e- Pakistan. In the Ceremony, Chief Minister, Sindh Syed Murad Ali Shah maintained that negative elements want to promote hate, instability and intolerance in the society. He called upon the society to practice Paigham-e- Pakistan to counter negative attitudes and termed Paigham-e- Pakistan as an omen of collective prudence of nation. He appreciated IIUI, Wifaq ul Madaris, legislators, intellectuals, Islamic scholars, Muftis and HEC for preparation of the narrative. The narrative provided logical and visible solutions against terrorism and extremism, he added. Dr. Mukhtar Ahmed said that nation was thankful to all the stakeholders and contributors who provided this narrative. He furthered that IIUI took the challenge in difficult times and delivered with a determination in the shape of Paigham-e- Pakistan. Dr. Mukhtar said that education is the base of progress and no nation can excel until it makes education its top priority. He also suggested that another narrative for education and heath should be introduced. IIUI Rector, Dr. Masoom Yasinzai thanked President of Pakistan for his support and leadership amid preparation of Paigham-e- Pakistan. He told that IIUI at its IRI had launched centers for promotion of peace and Islam and democracy which would help in dissemination of this cause. He added that this narrative was a continuous process and vowed that its dissemination would remain continue with same pace. 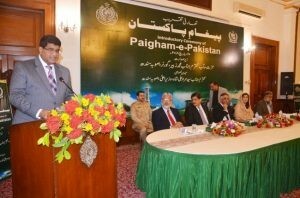 He also briefed about the activities held in connectivity of Paigham-e- Pakistan. Mufti Taqi Usmani also spoke on the occasion who said that role of Ulema was imperative in preparation of Paigham-e- Pakistan and said that Ulema would be amongst the leading g ranks whenever it would be about the cause of nation. 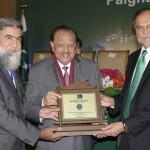 He also hailed IIUI for its efforts in preparation and promotion of Paigham-e- Pakistan. Ms. Shehla Raza also spoke in the ceremony and said that role of women in the society was vital and same was the case in preparation of Paigham-e- Pakistan. She told about Dukhtran-e-Pakistan project and vowed that women of the country would leave no stone unturned for the progress of nation and promotion of this narrative. The ceremony was also addressed by Mufti Muneeb ur Rehman, Mumtaz Hussain, Secretary General Jamat e Islami Sindh, Fyaz Hussain Naqvi, Coordinator Wifaq ul Madaris Shia, Maulana Muhammad Yousif Qasuri of Jamiyat Ahle Hadith, Dr. Abdur Rzaq Sikandr of wifaqul Madaris Al – Arabia.